Where do I post my biography? Using the form found here you post your biography in a new topic here. Where do I start roleplay? How will I know I'm accepted? You will see a post by a member of our staff on your biography explicitly stating that you have been accepted - your username would have also been turned teal by an administrator, and you will be granted access to many new boards. You can private message a member of staff or talk to us in the chatbox! We're here to help! Can I be another animal besides a wolf? Only other canines as your main character. For a list of allowed canines, please follow this link. 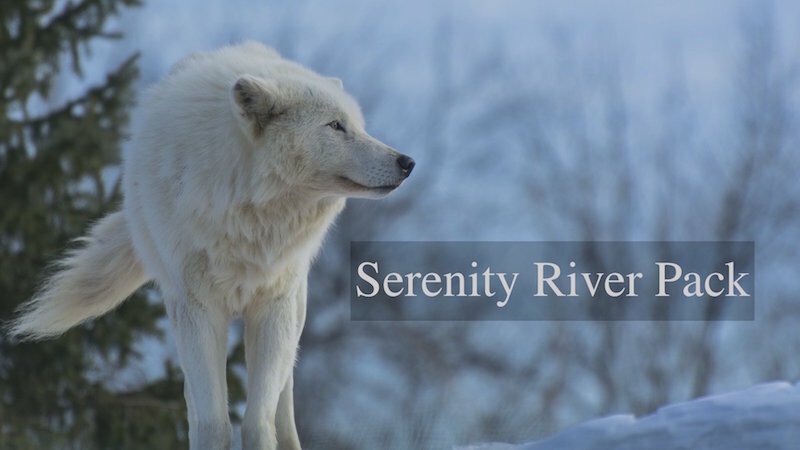 Serenity River Pack is a play-by-post literate roleplay. Play by post means each post a member makes contributes to the story in some way, and literate means we require all in character posts contain at least 100 words or more. We only accept third person roleplaying. Where do I chat with members? Assuming you are registered, you will see a box titled "Chatbox" at the top of the forum on the home page. Just click the link that says 'Log in' next to it to start instantly chatting with other members! Guests, you can use the shoutbox you see on the top of the forum to chat with us, or ask us questions for a fast response! Can my character have pups and a mate? Absolutely! However, having pups requires permission from the council. Yes, but only if you buy it! Follow this link to learn more about how to get a second character. I have an idea! Where do I share it? That's fantastic! Post a topic here including a poll with the options 'yes' or 'no'. Where do I post my artwork or writings? Artwork can be posted here. Alternatively, anything writing related aside from roleplay is posted here. Step 2) Have you tried looking around the forum for your answer? Step 3) Assuming you still have a question after these steps, waddle your way over to the link that says 'You have no new messages' and click it! Step 4) Do you know the staffs usernames? Fantastic! Click on new topic and compose a message to one of them containing your question! Can I change my character or it's age? Only once for free. After that, you must pay for each character change! Age is determined depending on how much time passes by, so be sure to keep up to date with that if you wish to age your character! How do I become a Staff, and what are they? Administrators and Moderators are the staff members of the website. Their job is to make sure all members follow the rules, to host contests or events, design the website, and generally keep everything running smoothly! When we are accepting new people into either position, we will open up applications, and choose people based on those and those alone. Please do not ask the staff to become a mod or admin! How do I post on the forums? For new topics, you are looking for the button that says 'new topic' at the top of each board upon clicking on it. To reply to a topic, look for the button that says 'reply', or use the quick reply box found at the bottom of the topic! Why don't I see a button to post? How do I send/check Private Messages? Click the link that says 'you have no new messages'. That message will change depending on how many unread private messages you have, such as to say you have one new message. To send a new private message, click the 'new topic' button and fill out the form! Backseat Moderating is when a user acts like they are a moderator when they are not. This includes but is not limited to: telling a user they are breaking the rules and correcting them, giving a user false information and presenting it as fact from the staff, or telling a user of corrections on their biography before it is accepted. How can I report someone who breaks the rules? Depending if it's a post or chatbox issue... for a post, click the button with the '!' in it. For a chatbox, take screenshots and send them to a staff member if they are not online. How come I typed a word but it showed up as something else? We have an automatic filter that change swear words or certain phrases we do not allow here. Please do not try to avoid the filter and say the word or phrase anyway if it corrects you. What should I do if staff locks/trashes my post/topic? Staff will usually give an explanation as to why they lock a topic or trash a post (the latter will be through PM). If you believe the post has been wrongly trashed or locked, PM the staff member who did so and ask them why. How did you make the forums? We are hosted by the free online forum service called [url=https://www.forumotion.com/]forumotion[/url]. Many of the things you see are custom coded by former designer, Sea. Mahina now handles site design and programming. Can you give me some codes for my forums? Sorry, but no. While we are more than happy to direct you to websites that distribute free codes, many of ours are custom and we are not so willing to give them away willy-nilly.